Philippine airlines is running an independence day sale, ON till June 10th. There’re some tempting fares to various destinations around the world- China, UK, Japan, US etc. However since Philippine airlines do not fly to India, Indian passengers can’t benefit from this sale directly. However, those based in Philippines, UAE, Singapore and various other countries where Philippine airline flies to can benefit from this deal. I saw a Dubai-Beijing return ticket for INR 31000 (Nov 27-Dec 04) which is super cheap. Ex Singapore, you can have a return ticket to Japan by about INR 25000, which is again very cheap. If you’re based in any of the cities where Philippine airline operates, you can benefit from their Independence day sale. Else check if the idea of flying to say Singapore and catching Philippine airlines from there makes sense to you. 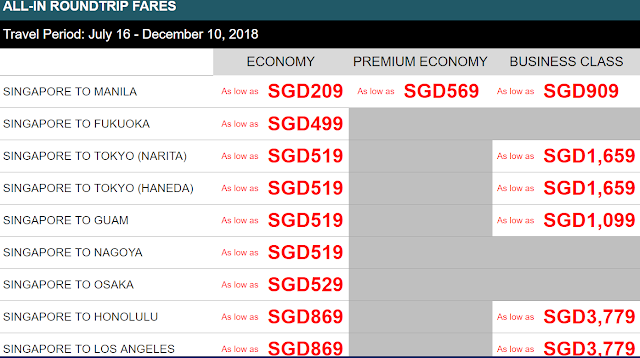 Note that Philippine Airline is a full service airline, so the fare includes meals and baggage but these being promo fares, are non refundable. I wish they consider some direct flight to India. Philippines has lots to be explored- Palawan islands, Cebu and other parts are great experience for tourists. One of the popular tourist island is temporarily closed for tourists to restore the beaches but there're other places worth exploring. Do check my Philippines posts from my 2017 visit.